Belmont University Celebrates 10-Year Anniversary of Pioneering Songwriting Major at Ocean Way Nashville Studio in Nashville, Tenn. September 27, 2017. Ten years after launching one of the nation’s first undergraduate songwriting majors, Belmont University’s Curb College of Entertainment and Music Business celebrated the pioneering program’s phenomenal success last night with a gathering on Music Row at the acclaimed Ocean Way Nashville studios, which the University owns. One of five programs in the Curb College, songwriting is a highly competitive major that requires a portfolio of original songs as part of the application process. Completed applications are reviewed by faculty and music industry partners. Currently, 260 students on Belmont’s campus are majoring in songwriting. Last night’s Music Row celebration featured comments from Nashville Songwriter Hall of Fame members Pat Alger and Tom Douglas as well as performances from rising talents Devin Dawson, Anna Vaus and Jake Rogers. 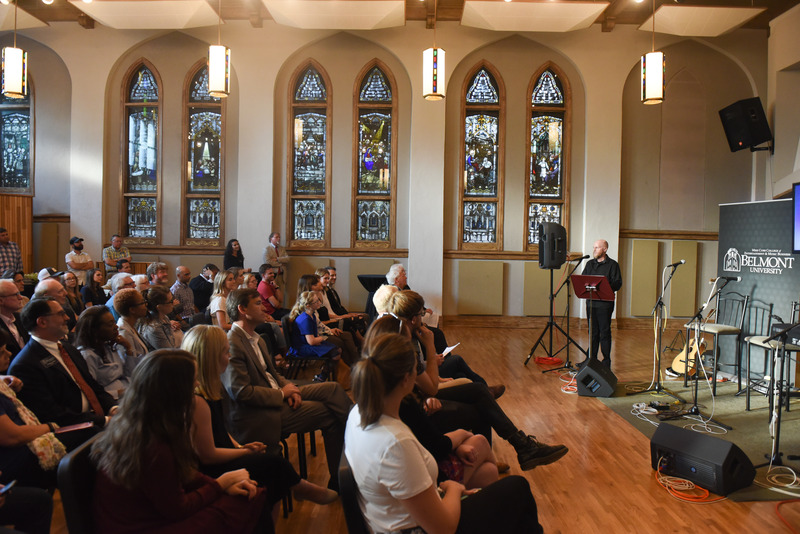 In addition, Curb College Dean Doug Howard presented Belmont President Dr. Bob Fisher with a custom Martin 000-15M acoustic solid mahogany guitar to commemorate the songwriting program’s first 10 years. The one-of-a-kind Bob Fisher signature model includes the Belmont University logo in the headstock. Dawson is presented with the scholarship, recently created in his name. Program also houses Bear House Writer Management, a student-run organization designed to serve up and coming Belmont student singer/songwriters. Their team of managers accepts applications and then chooses artist/writers that they feel they can assist with building a career. They guide and empower their clients by setting up industry meetings, co-writes, demo recordings and songwriter rounds. Program has partnered with a number of external orgs for student enrichment opportunities including ASCAP, SESAC, BMI, Communion Music Publishing, Make Music Nashville, Nashville Songwriters Hall of Fame, Sony Records Nashville, Warner Brothers Records Los Angeles, Universal Music Publishing, Sony/ATV Music Publishing, Big Machine Records, Curb Music, Disney Music Publishing, Warner Chappell Music Publishing, TV Show “Nashville,” Capitol Christian Music Group, Word Music Publishing, Centricity Music, Belfast Nashville Songwriters Festival, Operation Song, and more.